WASHINGTON, D.C. -- Though still historically high, Americans' confidence in the economy fell to a six-month low in May, largely dragged down by Democrats' worsening economic attitudes. 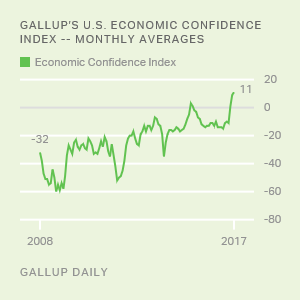 Gallup's U.S. Economic Confidence Index averaged a score of +3 in May, down slightly from April (+5) but eight points below January's record monthly high (+11). 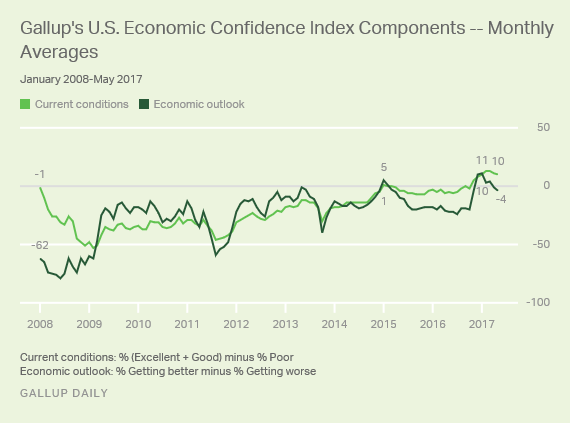 Gallup's U.S. Economic Confidence Index is the average of two components: how Americans rate current economic conditions and whether they believe the economy is improving or getting worse. The index has a theoretical maximum of +100 if all Americans were to say the economy is doing well and improving, and a theoretical minimum of -100 if all were to say the economy is doing poorly and getting worse. Confidence in early June appears to be no different from that in May, with the latest weekly average also +3 for the week ending June 4. Since the November presidential election, many Americans' attitudes about the economy have dramatically improved. 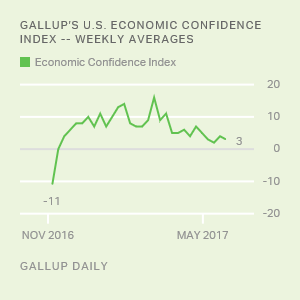 Both the weekly and monthly averages of Gallup's U.S. Economic Confidence Index now consistently produce positive figures rather than negative ones, as it largely did before the election. The sharp uptick in economic confidence after the election was largely attributable to surging confidence among Republicans, but President Donald Trump's business background or his economic proposals may have also convinced other Americans that the economy would prosper under his leadership. U.S. financial markets have seemed to subscribe to this line of thinking, with several indexes reaching all-time highs in 2017. 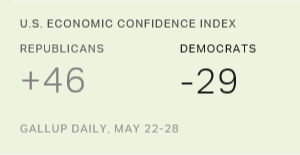 Over the past few months, however, confidence has fallen as economic attitudes of self-identified Democrats have worsened -- a trend that continued in May as Democrats' monthly index score fell to -26. This represents a five-point dip from April's average and the lowest monthly index score for Democrats since November 2011 (-29), when confidence was recovering from the tumble it took during the standoff between Congress and former President Barack Obama over raising the federal debt ceiling. However, independents' economic ratings have also dipped in recent months. After peaking at +5 in January, independents' index score fell into negative territory in April, when it averaged -1. It remained negative last month, with May's score reaching -3. Even as some Americans become more pessimistic about the economy overall, attitudes about the economy's current conditions have been relatively stable. Last month, 32% of Americans assessed the economy as "excellent" or "good," while 22% said the economy was "poor." Overall, the current conditions component averaged +10 in May, similar to +11 in April and three points shy of the nine-year high (+13) the measure hit in February and March. Meanwhile, perceptions about the economy's outlook have more clearly deteriorated. In May, slightly more Americans (49%) said the economy was "getting worse" than said it was "getting better" (45%). The economic outlook component stood at -4 for the month, representing a slight dip from April when the component averaged -1, and it is down notably from its record high in January of +11. 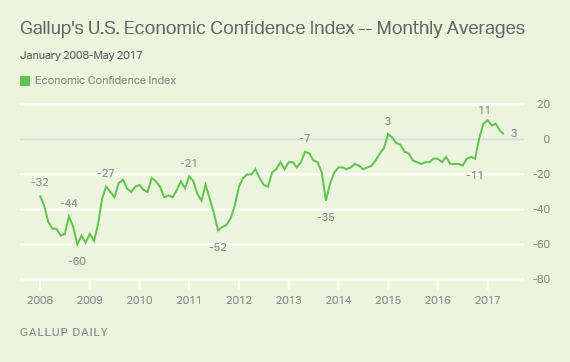 While Americans' confidence in the economy remains stronger than it was before the 2016 presidential election, it is not as strong as it was earlier this year. Republicans' confidence rose more sharply than Democrats' fell in the weeks after Trump's election. However, polarization being as it is, it seemed likely that Democrats would become increasingly pessimistic about the economy as the Obama administration (and its influence on the economy) fell farther in the rearview mirror. In May, this happened to some degree, with confidence among Democrats falling to its lowest level since November 2011. However, Democrats still express more confidence in the economy now than Republicans typically did when Barack Obama was president. Results for this Gallup poll are based on telephone interviews conducted May 1-31, 2017, on the Gallup U.S. Daily survey, with a random sample of 15,181 adults, aged 18 and older, living in all 50 U.S. states and the District of Columbia. For results based on the total sample of national adults, the margin of sampling error is ±1 percentage point at the 95% confidence level. All reported margins of sampling error include computed design effects for weighting. 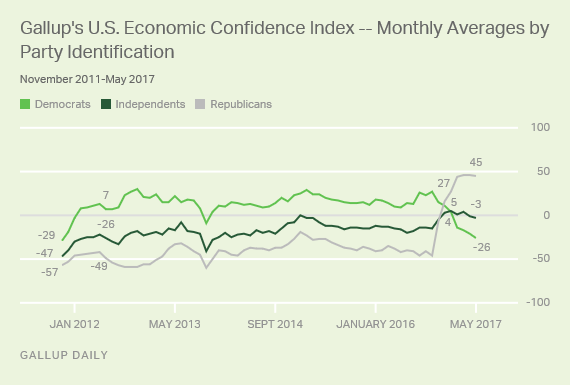 Republicans' confidence in the economy surged immediately after Donald Trump's inauguration, while Democrats' confidence has declined more gradually.